Mmmm… pizza. I have to say, pizza is one of the most wonderful foods to ever be created. I’m pretty sure I ate it every night for most of college. And I’m pretty sure I wasn’t particularly unique in that respect. So, last night, I made it! It turned out really well. The sauce was wonderful, but I’m going to keep experimenting with the homemade crust recipe. I like really thin crusts, and no matter how much I rolled this out, I couldn’t get it thin enough without the dough tearing. Probably I should eliminate the yeast all together, and I needed something to make it easier to roll. I’m definitely going to keep trying! The sauce, though, was perfect! 2. Combine water, yeast, and sugar in mixing bowl, and wait until yeast is frothy. 3. Mix flour, salt, olive oil, and spices into yeast mixture (mix salt into the second cup of flour to combine). 4. Place dough in a greased bowl, cover with a damp towel, and allow to rise for 30 minutes, or until doubled in size. 5. Roll dough out into a large pizza peel, or onto two medium-size baking sheets. 6. Bake at 375 degrees for 7 minutes, and set aside. 7. In a medium bowl, combine tomato paste, water, parmesan, sugar, and spices. Mix basil leaves into sauce. 8. Spread sauce on pre-baked crust. 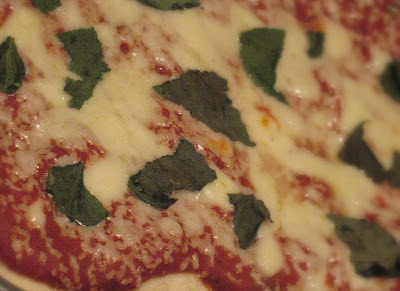 Top with mozzarella and basil leaves, and bake for 8-10 minutes at 375, or until cheese is browned. When you get the thin crust figured out let me know. I like my pizza crust – but…it’s kind of like my feelings about deep dish pizza – I love it, but it’s not really pizza. My crust is delicious, just not really a pizza crust… I want thin and crispy! I definitely will — I had never baked non-bread-machine bread until a week ago and now I’m obsessed! Crazy coincidence, though — I’m “Katy Z” too! Don’t eliminate the yeast. Try a wetter dough and knead for a minimal amount of time. Bon Appetit had a recipe in their March 2007 issue, and Todd English has a good recipe in his Figs cookbook. Worth a look! But the sauce looks tasty! Mmmm… love Todd English. Olives is one of my favorite restaurants! His flatbreads are incredible. I think you’re definitely right on the wetter dough — I could tell even before I started rolling it out that the dough was too hard/dry to get where I wanted it. I will see find his recipe online! I just made this, and I have to say, it is excellent! The sauce was a great blend of flavors, and the dough is excellent. I like my dough exactly how it turned out– soft, but kinda crispy on the bottom. I topped my pizza with ground beef, mushrooms, and green peppers, so I had to put the pizza in for like 20 minutes instead of 8-10 minutes. At any rate, this will definitely become a staple dinner for me! !